Rated 4 out of 5 by sunnyglow from CAN AMAX FIND REDEMPTION WITH THIS GAME? REVIEW BASED UPON THE ENTIRE GAME: 3 Chapters Plus a Bonus Chapter – Strategy Guide: 43 Pages OVERVIEW: Can you save mankind from the soul devourer, Olaf? You have been informed by the Keeper of the World, Kear, that you have been slated to be one of Olaf’s next victims. A mark on your wrist ties you to Olaf. Now, with the help of Kear, you must go to Redemption Cemetery to stop this evildoer before he escapes into the world. You only have until dawn to stop him from resurrecting the dead and bringing chaos to the world. His defeat lies in you returning to the past to save the first three souls he devoured. Can you stop him in time? OPINION: For me, this is a decent 4-star game, lacking in quality to be considered a 5-star game. Although it has many mini-games and HOP scenes, I consider it a short game. I played this game in a little over four (4) hours, including the bonus chapter. The dark muted colors provide a nice backdrop to the story. Nevertheless, I wish AMAX would eliminate the mounds of black smoke within their games. The pace is decent. 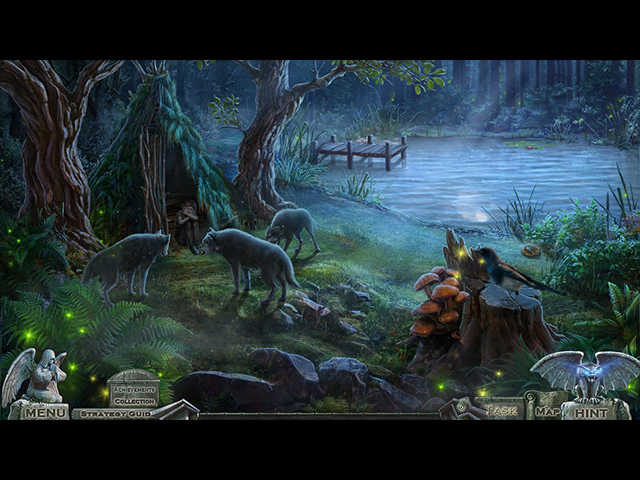 There are three stories set within different locations to maintain the player’s interest. There are only two collectibles. You collect coins, but I have no idea why they are collected since there are no items to purchase for some special room as with most AMAX games. 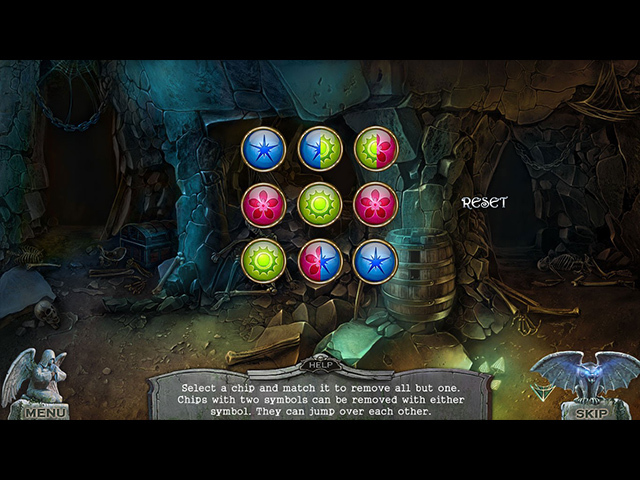 MECHANICS: There are four (4) levels of play including a customized version. There are twenty (20) achievements. Collect twenty-six (26) morphing skull coins and fourteen (14) cards. I found most easy to locate. There are eight (8) screensavers, twelve (12) wallpapers along with concept art, music and video sequences. You can replay eleven (11) HOP scenes and twelve (12) mini-games. BONUS CHAPTER: It is a sequel. Return to Redemption Cemetery to help your friend, Alex, locate his missing son, Dave. A demon has possessed Alex, using him to search for tablets which will allow this demon to return to the physical world. Return to the past in search of a memento to defeat this demon. I found the HOP scenes and puzzles within this chapter better than in the main game. You continue the search for the two collectibles. There are twelve (12) puzzles and thirteen (13) HOP scenes and mini-HOP scenes within this chapter. HOP SCENES: There are twenty-eight (28) HOP scenes and mini-HOP scenes within this game. I was disappointed in this aspect of the game. They lack variety, with most being lists of items. There are some matching scenes. There are only two scenes which I found somewhat creative, both of which are within the bonus chapter. There is one scene which provides a panoramic view in which to search for items. There is another scene within the same chapter in which you match up items by opening boxes. MINI-GAMES: There are forty-three (43) mini-games within the game. I found these better than the HOP scenes. There are some mini-games which can be played in either a “casual” or “hard” mode. There are repetitive puzzles (increasing in difficulty) to be played as you enter the past with each new character. However, I feel there are too many jigsaw-like puzzles dedicated to restoring some image. There are also quite a few maze mini-games. However, I found these creatively designed. SPOILERS: HERE ARE SOME OF THE PUZZLES AFTER THE DEMO: A. Mathematical puzzle. Begin with the number 20. Land on numbers on a grid so as they subtract from 20, you are left with zero (0) at the exit of a maze. B. Choice between “casual” and “hard” modes. Slat puzzle. Using arrows, move slats up-and-down and sideways to restore a picture (There are several of these within the game) C. Unique new puzzle. Jigsaw puzzle. Move pictures pieces into position to restore an image. As you move a piece, it will change the image. Adjust those pieces so they combine to produce an image. (There are several of these within the game) D. Maze puzzle. Move through a maze while avoiding falling rocks. If you get hit by rocks, you must restart the puzzle. E. Choice between Casual and Hard. Row, row, row your boat. Maze puzzle. Maneuver a boat to the finish line while avoiding whirlpools and ice. BONUS CHAPTER: F. Lock puzzle. Bend a wire to match a configuration within the tumblers of a lock G. Maze puzzle. Move a rotating flame through a maze to a wolf. What makes this difficult is that the wolf/wolves will keep moving his/their position. Since the flame is revolving you must click on the flame as approaches an opening or it may enter the entrance to another location. Another wolf is added with each level. 3X H. Matching puzzle. Match up tokens with each other until only one remains. Some of the tokens have two images on them which can be matched. You can jump over tokens; however, you must plot your moves so only one remains. Increases in difficulty with each new level. Rated 3 out of 5 by Majestyx12 from Very short Game Based on the finished game with bonus chapter I really liked the trial part and I bought it. Well, all I can say is I thought it went down hill after that. Some hops scenes are repeated. Too many fool with it puzzles. They made the puzzles harder. I only did the matching parts and skipped everything else. The bonus chapter is even worse. Rated 3 out of 5 by neese1173 from Redemption Cemetery: The Failed Mark What a HUGE disappointment . I love playing the Redemption games, and was so looking forward to playing this. The game, while in it, is a challenge and fun...the end is HORRIBLE! What a let down. it literally just ends. Done, credits rolling done. So disappointing. No Bonus chapter, just done. Even if there were a bonus chapter, I don't think I would even play it. Rated 3 out of 5 by shecrab from A bit too easy I have enjoyed Amax games a lot, and they really tend to vary in challenge. This last Redemption Cemetery was well-crafted, easy to navigate through, but just a bit too unchallenging as far as puzzles went. It ends abruptly, it has few real brain teasers in it, and would make a great "starter" game for someone--but for advanced players, it's not much. I prefer something more time-consuming and that has more puzzle-power in it, but this game is good for inexperienced or beginning players. Rated 3 out of 5 by dizzydame281 from Too short I have almost all of the Redemption Cemetery games and I was really looking forward to this one. The storyline was okay, but the game was so short, it took less than an hour to play the entire thing. I kept waiting for the challenge but it fell flat. Kinda disappointed in this one. Rated 3 out of 5 by bratzgram from Let down by the Cemetery :( I rarely do reviews since I no longer get Beta tests but had to for this game. This series has always been one of my favorites until now. Although I did enjoy the demo somewhat it was lame compared to past Redemption Cemetery releases. I found the mini games and HO's extremely easy. The visual was grainy and almost to dark. I read all the normal reviewers and thought maybe they were judging to harshly. After playing though, I have to agree. It's not a buy for me. Usually I hate to see the demo end while playing these. This time it was almost a relief. Rated 3 out of 5 by Volauvent from Just okay ... I love this series and frequently buy Redemption Cemetery episodes demo unseen, which I did this time. 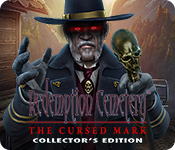 Curse of the Mark is not up to the Redemption Cemetery standards. It's as if the team handed it off to someone else. Who doesn't speak English, btw. Some of the directions are really screwy and the helpful messages (at the top of your screen, white on black) occasionally make no sense at all. For instance, "The stairs are so high" when there are no stairs at all. Like that. A lot. I'll play it through, but not with the usual relish. It's okay if you're a die-hard Redemption fan like me, but experts? You'll breeze through it, even with everything turned off. Rated 2 out of 5 by Bar80 from Too short As other reviewers have gone into an in depth review of the game, I'm only going to say that for a Collector's Edition, this game was way too short. Rated 2 out of 5 by fluffymunchkin from Not up to the usual Redemtion Cemetery Standards I love this series but was really disappointed by this one. It felt way too short. The graphics and sound were all good and I get the setting but this does restrict the games and I feel it holds this one back. Morphing objects are far more fun when you don't know what you are looking for. I hate it being the same thing throughout the game as it makes collecting them more of a chore than a fun part. This is an excellent series but this game is definately not the best of the series. Rated 2 out of 5 by timothya from This Time, A Miss Another entry in the Redemption Cemetery series whose strengths are outweighed by its weaknesses. It's the usual formula: the player must travel back in time to undo a tragedy and redeem three souls, thereby saving his or her own in the process. This time it's from a villain with the modest objective of using them to take over the world with an army of the dead. It's the first hint we receive that the writing might be a little shaky but hardly the last. Pros: some excellent hybrid HO scenes that hold the player's interest throughout. 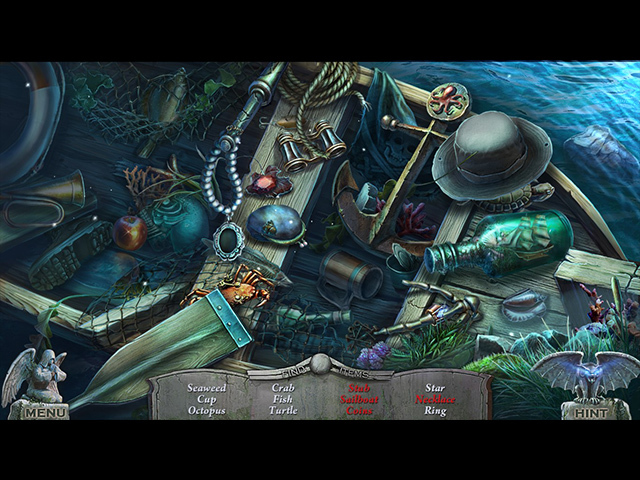 Good game mechanics, and puzzles quite up to the quality of the HO scenes. Cons: the writing. The plot is thin and cliche-ridden and the dialogue stiff and unconvincing. The premise of the series makes these games necessarily episodic in form but the glue holding the three episodes together is - ahem - an evil wizard with hundreds of captive souls at his command who may be undone by the redemption of only three for some unknown reason that we begin to suspect is that it's all the dev had time for. And not a great deal of time at that: the game is quite short. The souls in question are apparently not even those of the actual victims but those of people who feel badly about their deaths. And those deaths: a house fire, a buzz saw, and Hans Brinker? It's a mess. Overall, although the puzzles and the HO scenes are really quite good, the game needs a complete rewrite to save it from being just a string of unconnected puzzles and HO scenes. I finished this one very unsatisfied. Rated 2 out of 5 by lillyrush from Um.... I liked the graphics. I lasted 2 minutes into this game and that was the demo. I think we're done with the whole magic evil man/woman ghost thing. Rated 2 out of 5 by Granny_Gruff from This Cookie Cutter is Tarnished! You have nightmares about a strange sign and are contacted by Kear. He assures you that he knows what your problem is and how to fix it. You must meet him at the cemetery at midnight. You arrive early, in time to see Kear attacked by Olaf, a soul devourer. You will need to save not only Kear but Olaf's three earlier victims in order to save yourself. Your first soul to help is Deloris, a young woman whose husband disappeared, leaving her to raise their daughter, Lizzie, alone while trying to manage the family's vineyard. You will try to save the child from a burning house. Good stuff: The artwork is very recognizable as that of the series, being well drawn with muted colors. You will run around collecting threes and eights of various things that are in your face, including the collectible "morphing" coins - they are not morphing so much as blinking in and out of the picture. Bad stuff: If you don't instantly recognize everything about this game, you haven't played any of the series before this. The story is lack luster and a retread of earlier games. Only the names have been changed to confuse the public and make them think there might be something faintly interesting going on here. You will want to throw in the towel about the time you are decorating a scarecrow while a child is trapped in a burning house. Or perhaps the clouds of black smoke from the demon/soul devourer will get you sooner. (Can anyone explain why a demon/soul devourer would have a casket or be buried in a cemetery? As he's an unearthly presence, what would you put in the box?) Bottom line: I own ten of the Redemption Cemetery games because they were well done with interesting stories that drew you in with good puzzles and HOPs. I really wanted this one to be just as entertaining. I just don't need another cookie cutter! Please play the demo and decide for yourself. Rated 2 out of 5 by LosAngeHell from The sad demise of the Redemption Cemetery franchise The first Redemption Cemetery set a new standard for gaming and was a must buy. It was clever, cheeky, humorous, fun and surprising. Redemption Cemetery follow-up games also used to be great. I am surprised that this franchise has sunk so low. Were all the original devs with their smart ideas replaced with typical gaming dev clones who copied other games? How sad. This game has all the usual boring tropes you have seen and played before in other games: * Magic staff * Tattoo arm runes * Dumb puzzles * Characters I have seen too many times elsewhere * Many other typical elements too numerous to mention I could not stand playing the demo for long. It was too dull. My impression of this game? Meh. Rated 1 out of 5 by LunaNik from It's déjà vu all over again. And again. And again. I played 20 minutes. Well, to be honest, the game was running for 20 minutes, but I did take a few short naps. Every time I woke up, I thought, "I'm sure I've played this one before." In the first 3 scenes, there were: • 21 keys: 3 regular and 18 shaped. • 1 full-size HO, but 4 zoom box HOs (interactive list, storybook, FROG, multiples). • 2 matching pairs • 2 jigsaw puzzles, both childish. • 2 "moving one thing affects other things." Ugh. • Copy the combination that's right in front of you. • Rotate tiles to create 2 different paths. This series used to be good, back when dinosaurs roamed the earth. My personal favorite is Clock of Fate, because the gameplay was unique. This episode is an example of why a series should end once it jumps the shark. "New" isn't working for you, devs...try "improved" instead. Rated 1 out of 5 by tracilynne40 from Meh..Not Impressed I won't go into the storyline, everybody has already seen that. I found this game to be tedious at best. The graphics were sub-par. And collectors items were also. The plot has been done to death. I only played for around 30 minutes, hoping it would get better, but just couldn't hang on any longer. A couple of the mini games had you selecting one object that moved other objects. I loathe those kinds. I usually don't rate games unless I can give 5 stars, but I had to give this one 1 star just give my input. There was absolutely nothing I like about this game. What a major disappointment, because I loved the Redemption Cemetery series. I don't recommend this game. Rated 1 out of 5 by OldLady50 from No Redemption This series has steadily decreased in quality and originality. It's past it's expiry date, please, let it die a peaceful death with this episode.